This unique program takes you to the City of Light and immerses you into French culture through academic coursework and homestays. To learn more about the people and culture of France, students live in homestays and engage in course field trips to museums and sites around Paris. Hollins University was among the first colleges in the nation to offer an international study program in Paris, in 1955. 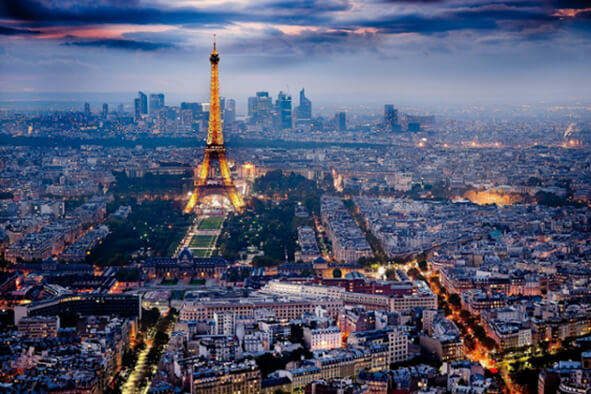 While in Paris you’ll take at least one French language course, but can then choose from two different program tracks, depending on your academic interests. The Hybrid Track allows you to take courses at one of Paris’ top universities from across a wide range of disciplines. The Advanced Immersion Track is a wonderful option for French majors (or even minors) as you’ll take a variety of courses taught in French that focus on different subjects, such as literature, art, business, etc. This program is an great fit for students studying English, CMCS, Anthropology, International Relations, all business disciplines, Economics, Sociology, PoliSci, and more. To participate in the program, students must have taken a minimum of two semesters of French. Program no longer available after Spring 2019. Students are responsible for booking their own flights to Paris. Upon arrival in September, the fall group goes on a four-day tour of Normandy as part of orientation. Destinations include Caen, Bayeux, the D-Day beaches, Deauville, Mont St Michel, Honfleur, and Rouen. In the spring, the group goes to southern France to visit Nice, Saint-Paul de Vence, les Baux de Provence, Chateauneuf-du-Pape, Arles, and Avignon. In both fall and spring, there is also an orientation in Paris to introduce students to the city. Hollins runs one of the original study abroad programs in Paris. Started in 1955, the program now combines outstanding academics, excursions in Paris and around France, as well as immersive homestays with Parisian families. This program includes coursework taken with Hollins faculty members in Reid Hall as well as coursework taken at one of three partner universities in Paris. Hollins classrooms are located in Reid Hall, just off Blvd. Montparnasse, near the Jardin du Luxembourg and close to the Sorbonne. This track is a good fit for non-French majors as it offers lower-level French language classes AND content classes taught in English. You'll take a core curriculum of two required courses taught by Hollins faculty members and two elective courses, taught in English at some of Paris' top universities: The American Business School, Institut Catholique, or Mod'Art. Each school specializes in certain academic fields; business, humanities, and fine art, respectively. Course subjects include studio art, dance, theatre, film, writing, international business, international relations, political science, and history, to name a few. French Language Class (intermediate): This course teaches fundamental language skills that will enable students to interact across daily life in France. French Culture & Society: Here you'll study major historical, social, and cultural events/movements that have shaped modern France. The course is taught in basic French as well as in English. It also includes excursions to museums, monuments, and various cultural events. This track is a good fit for French majors as all four courses are taught in French. You'll take all four courses with Hollins faculty members, many of whom have studied at the Sorbonne and other elite universities in Paris. Course topics include literature, art, international relations, politics, film, and theatre, among others. This track also includes field trips around Paris, group excursions to other regions of France, along with many other cultural activities designed to fully immerse you in French culture. On both tracks, students take four courses and each course is worth four Rollins credit hours. Therefore, students will typically earn 16 Rollins semester hours. J-Term French Language Course: Hollins also offers a J-Term intensive French language option in Tours before the program begins which is a great way to prepare for your semester in France. Please contact IP if interested as scholarship opportunites exist for this experience. Students participating on this program will need to seek the appropriate departmental approval for all major/minor requirements and approval for General Education Requirements through Student Records. All courses on this program appear on the Rollins transcript as transfer credits and the grades are factored into the Rollins GPA. Students who successfully complete this program through Rollins will receive an official transcript from Hollins University. It can take up to 3 months to receive the official transcript. On this program you’ll live with a Parisian host family and authentically experience the French way of life. You’ll gain firsthand knowledge of French family life, and daily conversations will help reinforce French skills, solidify knowledge of French grammar, and add to the overall ease and familiarity with the language and culture. Homestays are in the residential areas of Paris, with convenient connections on public transportation to Reid Hall. You’ll have your own room, own set of keys, and will be treated as an independent adult. In most cases, you’ll be the only student in the homestay, only very few will host more than one student. The program director will match you with your host family based on information you provide in the Hollins application. All hosts are carefully screened by the program director and most families have worked with Hollins for many years, receiving excellent student evaluations. French hosts provide all breakfasts and five dinners per week. You'll receive a stipend on-site to cover the costs of lunches and the remaining dinners. To introduce you to the gastronomic pleasures of France, we offer an optional non-credit course in French culinary arts. You may visit a traditional French bakery, try your skills in a French cooking class, take a guided tour of gourmet shops and indoor and outdoor markets. You'll also enjoy a wine tasting session with experts who will share the cultural history of wine. There is an extra fee for this course. Rollins will not pay this fee; the student will be billed. You may participate in other activities in Paris like visits to museums, famous buildings, etc. There is also a creative writing workshop led by a French writer. Field trips to Normandy, Giverny and Burgundy in the Fall. Field trip to Provence, Loire Valley in the Spring. In both fall and spring, the arrival program in Paris includes guided visits within Paris (including the Louvre, Notre Dame, La Sainte Chapelle), and trips to Giverny, and Versailles.